Fasten your own mask before tending to the child’s… It makes sense. 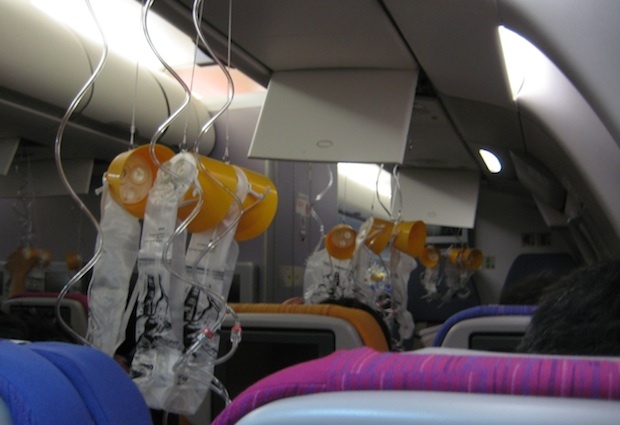 If I were traveling with a small child and there were a need for oxygen, and I tried to fasten their mask first, I might run out of air myself and lose consciousness before I could fasten my own. Though I will admit that now that I am a parent, I suspect I would find the instruction difficult to carry out. I understand it, sure. But if my kid were gasping for air, my heart would yearn to fix that, even though my head would understand that I had to tend to my own needs first. When my beloveds are gasping for air – whether literally because of illness, or metaphorically because they’re in a difficult place where the emotional air feels thin – my heart yearns to fix that, too. And when my heart is yearning to help someone else, it can be difficult to remember my own oxygen mask. But if I don’t ensure that my own needs are met, I don’t have a full tank to draw on in my work of caring for others – whether my family, my friends, my congregation, or the nonprofit organizations I serve. If I’m not getting the sustenance I need, I can’t do the work I’m here to do in the world. Putting my own needs first shouldn’t feel like a radical act, but it does. Especially when there is so much that’s broken in the world. But I can’t tend to that brokenness if I’m not whole, myself. That’s one of the messages I find in the Jewish practice of observing Shabbat, a sabbath after six days of work. On a regular basis I need to fasten my oxygen mask, shed the anxieties of the week, and take some deep breaths. My friend and colleague Rabbi Arthur Waskow has taught that we speak a prayer – a holy Name – every time we breathe in and out. Our very breathing can be a way of connecting ourselves with something greater than ourselves. Connect your oxygen mask and take care of you. From there you can tend to those around you who are in need.